I haven't managed to finish up the Shadespire minis. Screwy head and lack of focus made working on them a little difficult. Tanks are easy, though, so I finished up this Leman Russ tank that's been haunting the edges of may painting desk for far too long. I bought it off eBay ages ago already assembled. So the tracks are a bit messed up at the back and there are a few other things that don't quite match up... In fact when I got it the turret was glued down the the hull. 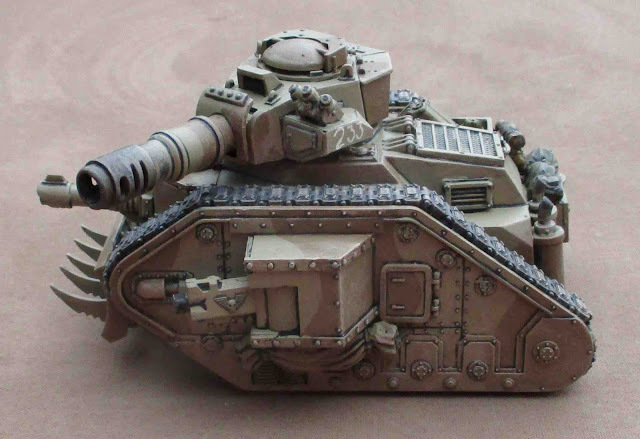 I managed to pry it off and found that the older version of the Leman Russ had a separate ring that was glued to the base of turret - which has the tabs that fit into the slots on the hull the allow the turret to remain attached, but till rotate freely - it was glued on upside down so the tabs were inside the turret!? I actually managed to carve this off and flip it so now I have an operating turret. I think it could have done with a bit more kit hanging off of it.. I though of using Arabic - as the Tallarn seem to culturally similar to Terran Arabs. This tanks name is supposed to be "Sala" or "prayer". 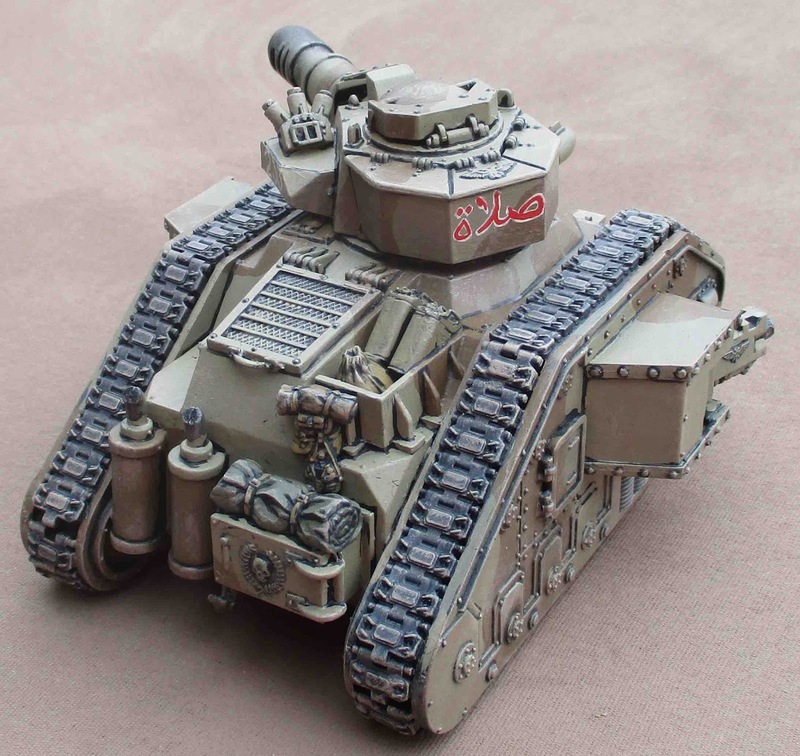 I was thinking I might pick up a fifth tank and calling this the "Pillar Platoon" and naming each after the 5 pillars of Islam (Faith, Charity, Prayer, Fasting and Pilgrimage). I figured as new societies overtake others they often co-opt elements of the existing societies religion when converting them to their own. In the Grim Darkness of the 41st Millennium, a planet that had been settled by Muslims at one point, when brought back into the Imperial fold after the Age of Darkness, might simply replace Allah with the Emperor...? I also looked up words I could use for names on my Scout Sentinets ("Swift", "Watchful", "Vigilant", etc...). Of course "Tallarn" isn't a real English word so I couldn't translate it. I tried looking for faux Arabic scripts and tried Writing Tallarn with that... I'm not so happy with it. I may have to repaint that.. Maybe just try to spell it phonetically with Arabic script? 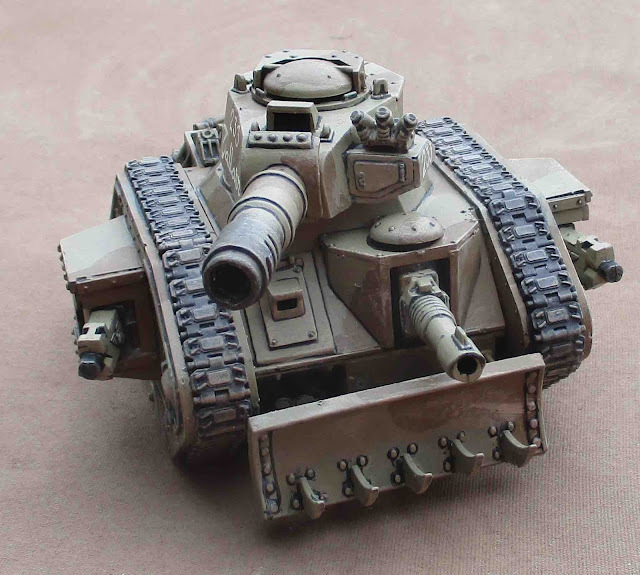 I do have three other Leman Rus tanks to assemble and paint, two will be battle tanks and the third will be a Punisher variant - with the Punisher gatling cannon (with the new grinding advance rule, it will spit out forty (40!) dice per turn at Strength 5! It will be named Zakat (almsgiving/Charity). If I add a fifth, it will probably just be another battle tank... maybe a Vanquisher...? 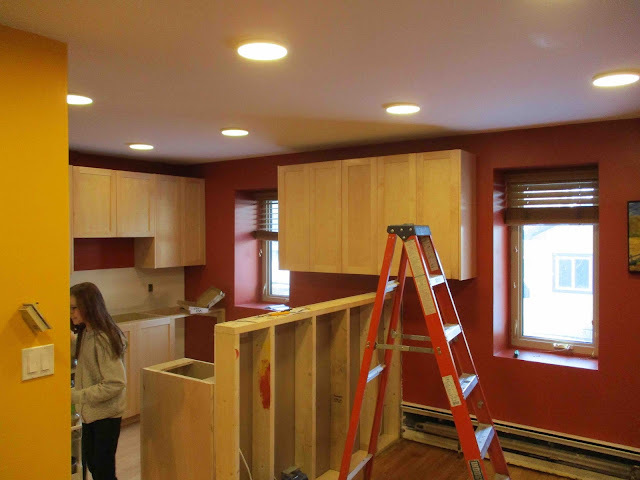 Cabinets and lights went into the kitchen this week! The countertop people came on Thursday to make their templates. Unfortunately it won't be until the 18th that they will be installed... but hopefully the tile guy will be able to come on the 18th/20th, and the plumbers are books for the 21st/22nd and then it will all be done just in time for the holidaze!! Sounds like you encountered similar issues to myself with buying a completed Russ from fleaBay. They come up alright in the end with a little care and attention though. I like your reasoning and execution of the markings too. 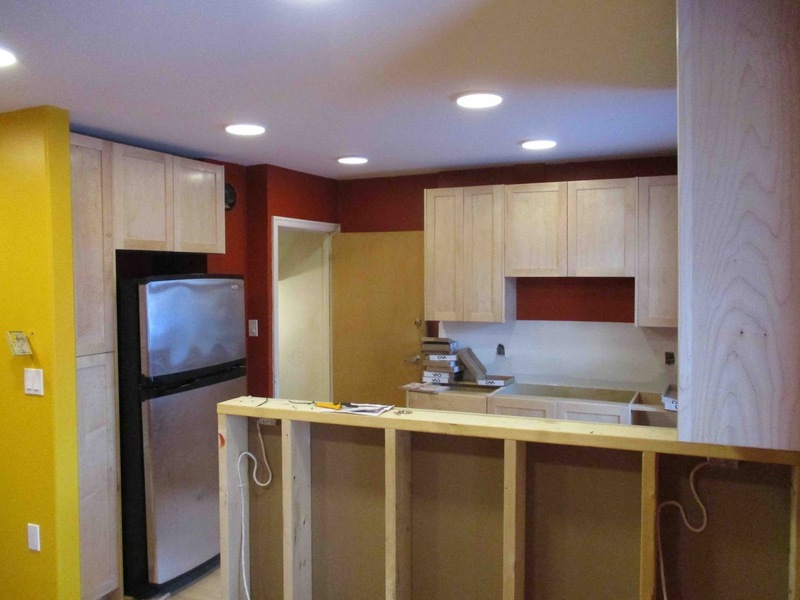 And the kitchen is really starting to look good. Hopefully all will be done in time for the holidays! Heh... well a year or so ago before 8th edition came out assembled tanks could be had for half price - and I'm a sucker for a bargain! I'd gotten a Chimera before I got this and it was in pretty good condition... so I thought I'd grab this one. As you say, it (mostly) turned out okay... Once I have a troop of them on the table - no one will notice if one of them looks a little wonky. Tank looks great after your care and attention the markings make sense to me, I'd see why you'd like a little pop of colour which the playing cards would have given but the red writing is good. 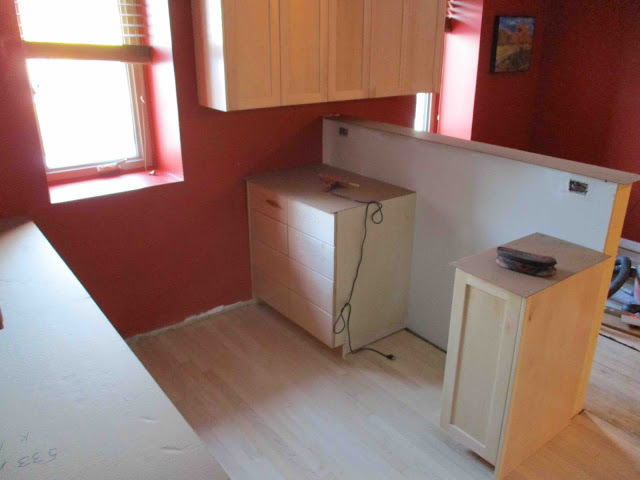 Kitchen looks good, I'm just on the woodwork on the staircase in the corner of the kitchen, newel posts, skirts and spindles lots of white! I still may add a unit device of some sort - which would add a touch more colour. You'll have to post pictures of YOUR kitchen somewhere when it's all done! Great work Tim - those model rehabilitation projects always seem to pay off when skilled folks like you guys can get to them - my friend Dallas is a whiz at "rescuing" model vehicles which had a tough start. Thanks Greg! Well it pays off when you can pick them up cheap - which has been harder to do these last few months since 8th came out... 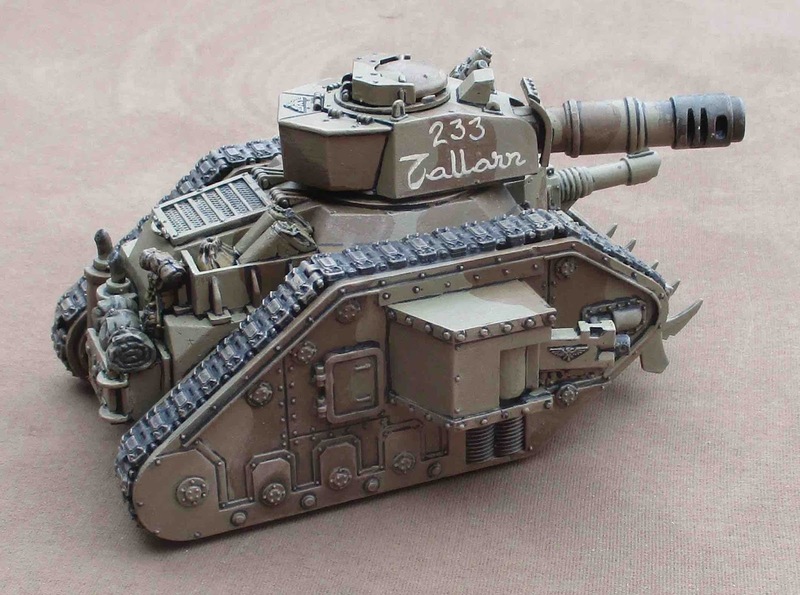 I've seen poorly painted/assembled tanks sell on eBay for more than buying the damned thing new would be! My only theory is that some people just HATE assembling and painting and are willing to pay a bit more for something assembled and painted - even if it's been poorly assembled and painted!? Very good! The pseudo-Arabic "tallarn" looks good to me. You could probably cake a little "mud" onto the tracks, and cover up that gap if you wanted. and lol at "Charity" for the punisher variant. I tried figuring out how to spell it phonetically with actual Arabic and what I came up with looks pretty cool, so I may be repainting. That's a brilliant idea about the mud.! I may not use it for this one. In my mind's eye I imagine these driving through dry desert and I'm not that picky... I'll definitely keep it in mind if I ever have the same problem with other tanks though!